No doubt many of you heard about the recent toil and trouble in Georgia. The Georgia Governor vetoed a controversial "Religious Liberty Bill" because major film studios, sports leagues and business leaders threatened to pull jobs from Georgia if the law went into effect. Putting aside any and all merits or demerits of the law, the news from Georgia brings to mind a concern I hear occasionally from some neighbors who worry that the effort to bring fair filming practices to Altadena might chase away film jobs. Clearly chasing off jobs is a serious concern. But is it true? I heard the call and started surfing for data. I didn't have to look far. Both the California Film Commission (CFC) and FilmLA have produced a pile of annual reports which prove, beyond any doubt, they are bonafide bureaucracies dedicated to the extraction of ever more government funds. They've been quite successful! This past year Governor Brown signed AB 1839 which creates the Film and Television Tax Credit Program 2.0. 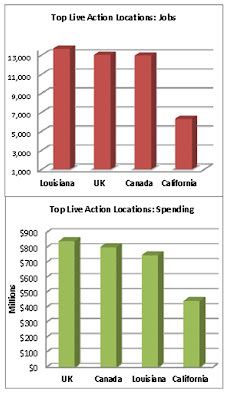 The program provides a tidy $1.55B in California tax credits to film companies that keep film jobs here in California. That's about $8.50 per year in extra tax for every person living in the Golden State. The FilmLA report offers this pithy summary: "....Industry experts widely agree that film tax incentives are the primary cause of runaway production...the proliferation of out‐of‐state film incentive programs has eroded California’s one‐time dominance of the feature film production industry." In other words fork over tax credits to compete or lose jobs. That message certainly got through to the State Legislature. Back in '09, the California Legislature passed the Film and Television Tax Credit Program 1.0 — a $500M, 5 year program to keep the productions from "running away" to greener pastures. According to the CFC reports, Program 1.0 was a rip roaring success. The program is reported to have saved jobs for 42,000 Crew Members, 23,000 Cast Members, 543,000 Background Actors. That's enough jobs to populate a city bigger than Sacramento. However, since those numbers represent project assignments, the number of equivalent full-time jobs would be much smaller. Despite the success of Program 1.0, the job drain has continued. Under that stodgy, old 1.0 program, many production types were excluded from from the state's largess. In fact the qualifying criteria kept the likes of big budget movies (>$75M), TV pilots and 1-hour TV series out of the game. The results: 85% of these 'loser' projects headed off to the lands of plentiful tax credit (CFC). That daunting 85% loss convinced our representatives in Sacramento to pass a 2.0 program that's 250% larger than 1.0. Time will tell if the new program will stem the flow. In case your thinking. "I should get in on the action," be prepared to sharpen your guestimation and paperwork skills. The gatekeepers at the CFC want see budgets, shooting schedules (including days and locations), screenplay with scene numbers, the breakdown of "qualified" jobs, proof of financing and a half-dozen other goodies before production starts. That's only the start. There's more bureaucratic joy when it comes time to use the credits. A better name for program 2.0 might be the Film/Television Tax Credit and Accountant Full-Employment Program. Is the film industry getting an unusually sweet deal? Does the State government provide financial incentives for other industries? Why yes! There's a proliferation of California business development programs. There are incentives for businesses that want to move here, for R&D, for hiring in economic development areas, for efficient energy and environmental companies, for industrial development and advance transportation. Is it any wonder that, according to the Governor's very own Office of Business and Economic Development that California is the "largest, richest and most diverse economy in the United States... and a national leader in job creation"? As Altadeneans we can rest assured that there's a considerable effort to keep film production jobs in California, and that we are doing our share — at least to the tune of ~$8.50 per person/year. It's also reassuring that none of the CFC or FilmLA reports mentioned the slightest concern about jobs loss due to enforcement of permit conditions or neighborhood overuse. Let us rest assured that fair filming in Altadena poses no risk to film industry jobs. However, while film industry jobs may not be at risk, film shoots in Altadena maybe. As I was poking around I stumbled on some interesting tidbits. But that's a topic for another day. Looking at the same data, I'm not certain that I arrive at the same conclusion that you do. Let's debate over lunch. Hi Jim. Many, many thanks for your comment. I definitely want to get this right. If you've spotted an error in the numbers, please let me know what you found so I can check my arithmetic and the supporting data. If there's an error, I'll fix it. Look forward to lunch. Soon I hope. I suspect that the scale of Altadena film production incentives relative to CA vs the rest of the world makes the two unrelated. My guess, without being in the business, is that the studio would decide first what part of the world to make a movie in, then decide where in that part of the world. So if Altadena's too unwelcoming, they'll go someplace else locally rather than, say, Louisiana. Or they've already decided to go to Louisiana, and it doesn't matter. Hi Jim. Many thanks for taking the time to read and comment. Way back in Miocene time, I was in the film business. Back then it was all about the budget. The advantage of shooting on location was that it saved oodles. It's expensive to build sets that look authentically like a place. And, you can find often local spots in LA that look like the scripted setting. And course there's CGI. Unless things have changed a lot the "what part of the world" choice comes after the money. The ascendency of the tax breaks (i.e. the money) is made very clear in the CFC and FilmLA reports. If they're right, if Louisiana did away with tax credit, the biz would probably leave Louisiana or Georgia for greener pastures. You can be plenty friendly, but it's the tax incentives that matter. I in practise concerns about "welcoming" aren't a factor. If a neighbor agrees to host a shoot and FilmLA grants a permit, then the coast is clear. Neighborhood attitudes toward film are seldom a factor. And, if the frequency of film shoots in neighboring communities is any measure, stricter rules wouldn't make a difference either. Add to that that the cost of permit in Altadena is higher than areas in the county (e.g. Riverside, Santa Clarita) which coordinate their own film permitting. 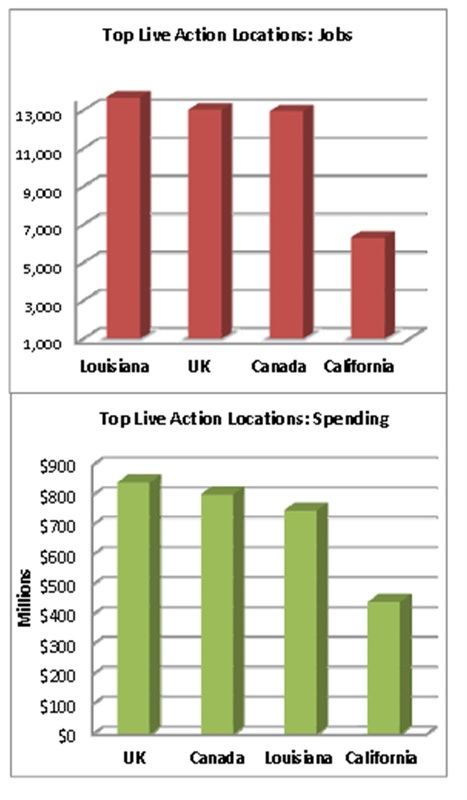 And that's not to mention the state tax incentives reward companies that leave LA. Despite that there appears to be, on average, 500 permits per year in Altadena. Of course we want to be welcoming, but it's not really an issue. It's the money that matters. It appears the tax credits are effective. More on the effectiveness of tax credits.